Look, I know it’s true that summer is nearly over. 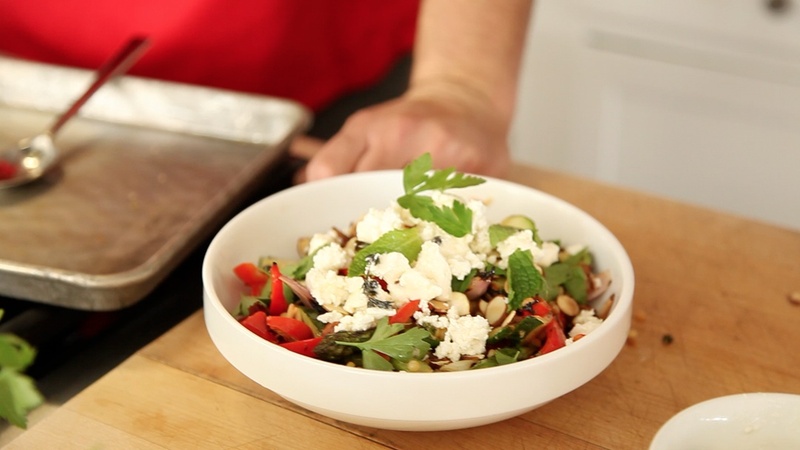 My friend Liesl and I shot this video at the beginning of the summer and we’ve only just now been able to share with you two of our favorite grilled summer salads (editing, vacations, work, children, etc.). Anyway, it’s pretty much always summer in Southern California. So if you’re local(ish) give these recipes a try. If you live elsewhere and you’ve already put the winter tarp over your grill you might have to live vicariously through us. Sorry. But really, these dishes are great all year round. Both salads are healthy, light, and unfussy. Watching the video you’ll notice we grill inside, mostly for the ease of the video, but also because we wanted to demonstrate that with a decent grill-pan or griddle you can duplicate that outdoor feel with minimal exertion or muss, although having a decent exhaust fan and good ventilation is a big plus. Especially the way I grill — all flame and smoke and action. I shot this video when Vivian was four weeks old, so I’m visibly tired. Sorry, folks, I did my best. You might notice that I have a habit of using the word “fantastic” a whole lot. But really, I only use it a few more times that I use the word “dynamite”. I’ve posted the ingredients you need to make my Thai Steak Salad. Watch the video for instructions. Liesl should be posting a recipe on her own blog shortly. Liesl and I (with our collaborators at The Other House) were striving for a light, conversational tone. Unlike my first two videos, this feels more like a cooking show. We wanted to explore our own on-screen chemistry and see if we could make it fun, light, informative, maybe a little silly. I think we succeeded. Drop me a comment and let me know your thoughts on this ongoing video project. I urge you to check out Liesl’s blog Lieslicious; it’s accessible and informative with an engaging, easygoing style. She’s got some great recipes, great pics, and video links to her spots for KIN Community. I’ve got the link here, but I’ve added her site to my blog roll to your right. Anyway, enjoy the video and share it with your friends! If you like it, LIKE it! Liesl’s grilled veggie salad with Israeli couscous.